The farmer’s market yesterday was like a feast for the eyes! The harvest is in and the take is bountiful. I spotted the baby purple Tiger eggplants and was captured by their color. I decided to buy them first, then I asked the woman in line why she was also buying them. She said they were tender and the skin is edible, not tough, like other eggplants. Sold! Not only are these babies rich in color, they are rich in nutrients. Eggplant is a seasonal super food! I created this eggplant dish based on a tasty dish of squash concocted by my childhood friend who I have endearingly nicknamed “Barbie of Sunny Acres.” Barbie, Donna, and I enjoyed her squash dish on her sun porch flanked by a vase full of sunflowers. 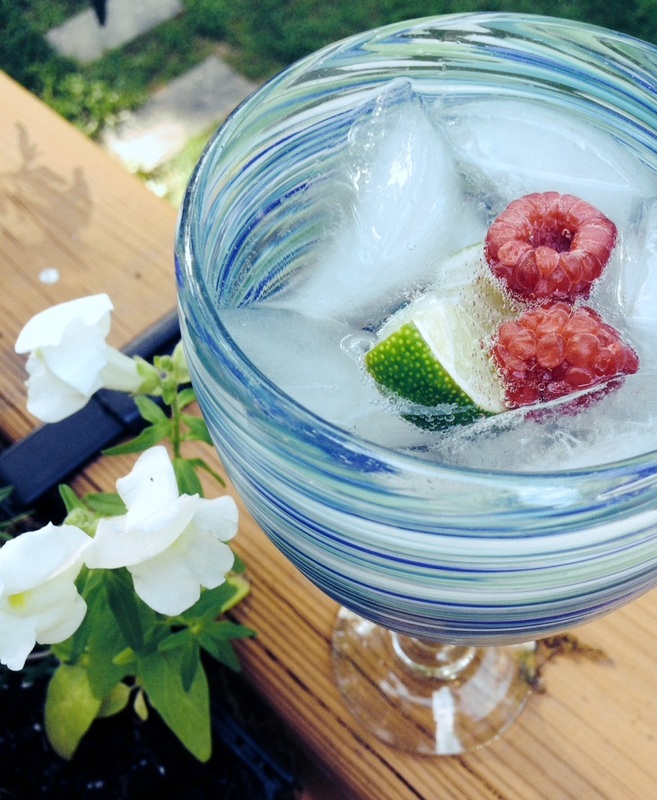 With this in mind, I created a recipe full of summer’s best. 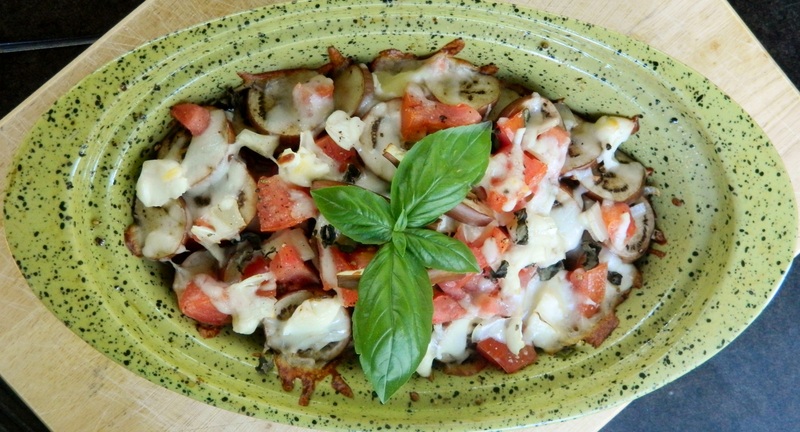 Use my recipe as a starting point then make it your own by substituting different cheeses, herbs, and vegetables. Next time I am going to use the baby eggplant in a frittata (baked with eggs and cheese). You can’t go wrong when it’s all from the garden! Thank you to Barbie of Sunny Acres for the genesis of this recipe and for the memory of hospitality. 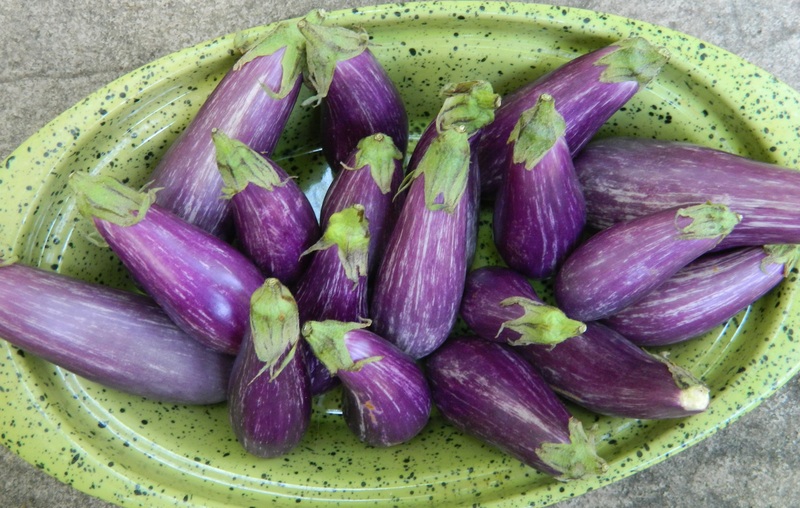 The tender baby eggplants don’t require sautéing or over salting to make them tender. Slicing them fresh and putting them directly into the casserole dish makes this recipe easy and quick. You can substitute herbed goat cheese or feta for the cream cheese, and cheddar or Monterey Jack for the mozzarella. You can also substitute fresh red pepper for the tomatoes. Spray a one-quart casserole dish with cooking spray. Place half of the sliced eggplants in a single layer in dish, overlapping a bit. Sprinkle with one half each of the chopped onion, tomatoes, and basil. Sprinkle with one tablespoon of olive oil and season with salt and pepper. Dot this eggplant layer with one-half of the cream cheese and sprinkle one-half of the shredded mozzarella. Repeat the layering process ending with the shredded mozzarella on top. Bake uncovered in a 350 degree oven for 45 minutes. “Incredibly refreshing.” – Donna G.
“Sprodka time!” – Hollace G.
“I’d love to come by and try your Sprodka.” – Mike D.
I’ve never blogged about the Sprodka before, so I’m putting it out — right here, right now. When it becomes a worldwide sensation recorded in mixology manuals, I want you to know it started in the Kelley house. Summer is time to get together but we don’t have to fuss — it’s hot and we just want to be with family and friends and relax. 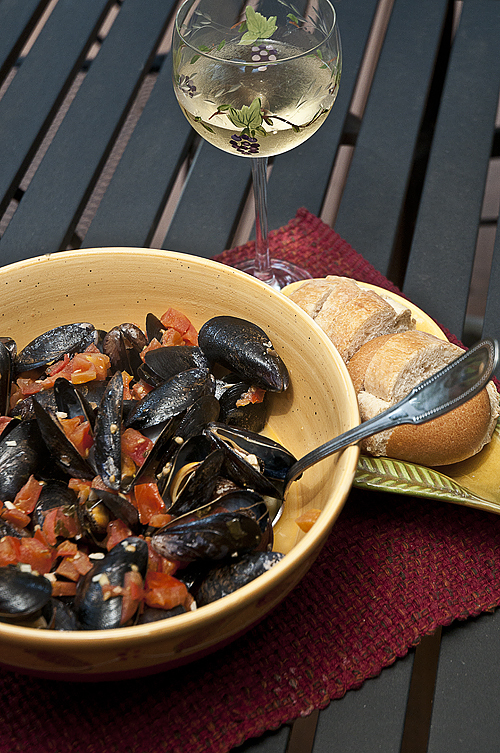 Easy summer fare is steamed mussels. Add some French bread to sop up the buttery sauce, maybe a salad, and some cool beverages and you have a meal. Bring out the lawn chairs, sweep off the porch, and roll out the welcome mat! Wash mussels and set aside. Sauté chopped garlic in olive oil in a large sauce pan until soft. Add butter, chopped tomatoes and fresh basil. Stir until butter is melted. Add white wine and mussels and steam for 10-12 minutes. All shells should open; if they don’t, discard them. Serve immediately. This recipe was adapted from Delicious Memories of Karen’s Kitchen (Morris Press Cookbooks, 2007) — A collection of recipes by family and friends of Karen Circharo to support the Karen Circharo Memorial Fund. 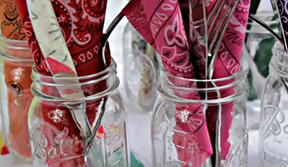 Proceeds from the cookbook benefit the Sister to Sister: The Women’s Heart Health Foundation. I didn’t know Karen, who passed away at 47 from heart disease; the book was a gift to me. Like so many of these homegrown cookbooks, the recipes are fabulous because people submit their finest. The dedication in the book, written by Robin Silvis, reports that Karen Marie Circharo was a creative cook, wonderful hostess, loving wife, devoted mother and so much more. I would have loved to meet her. 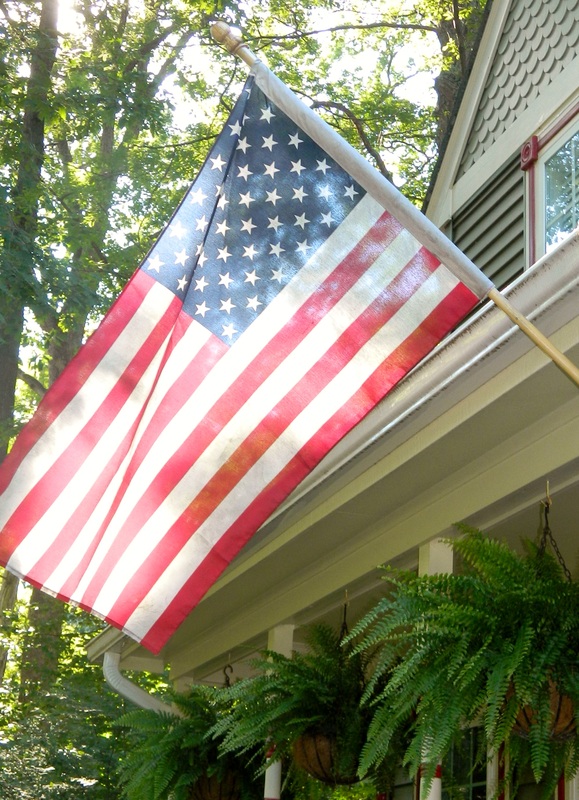 Happy Fourth of July…from our front porch to yours! Stay with me this summer as we prepare food and warm welcomes. 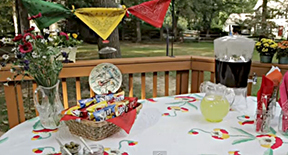 With the Fourth of July fast approaching and other summer picnics in the making, think of new ways to add simple style — guaranteed to deliver interest to the ordinary picnic. Watch my e-How video for inspiration and take it from here! Games — croquet, kickball, bean bag toss, you name it! Good food of your choice! A warm welcome to make your guests glad they came.